The storm for next Tuesday has fallen apart. It will only have a mild effect on our weather. After today, it looks like we may start to finally move into a more stable, summer pattern of weather. 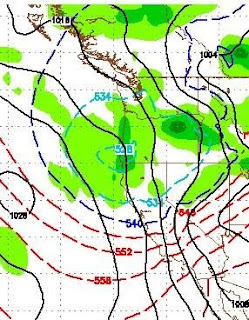 That pattern builds a huge high pressure ridge off the California coast and we are dominated by warm sunny days. Looking ahead, we will see some 90's toward the end of the first week in June. That will signify that we are in a summer weather pattern. After that, you won't hear from me again for a while. If you want to know how the global warming hysteria has become so out of hand, follow the money trail. There are billions in grants out there for "scientists" to uncover evidence of global warming. There are no such grants available to refute it. Starting tomorrow afternoon we should have about 4 days of clouds, rain and cool weather. The mountains will get a fairly healthy dose of snow. Memorial, however, is looking dry, but cool with highs in the mid-70's at best. Then another storm comes in the Tuesday after memorial. 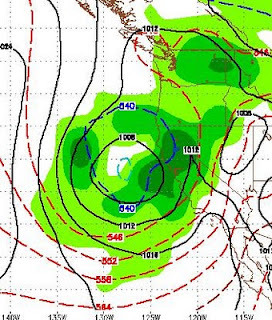 The storm I talked about last week has held together nicely and is poised to move into Northern California on Tuesday. 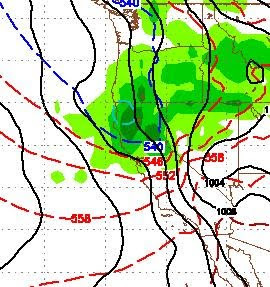 This storm will hit the Sierra Tuesday afternoon and affect our weather until about Friday afternoon. It will bring cooler than average temperatures to the entire region. The valley's will pick up about 1/2 inch to an inch of rain over the next 4 days and the mountains will get about 1-3 inches. That could translate into about 18-24 inches of wet snow above 7,500 feet. If this holds, that is quite impressive for this time of year. Remember, however, things can change.